Alyce reminds me of one of my favorite bumper sticker questions, "how's the cancerous phase of unregulated crony, casino capitalism working for you?" The greedy selfish with their teenage narcissism are large and in charge. They are putting their sociopath queen's philosophy proudly in the driver's seat. I remember, as a teenager, many year's ago, when I was telling my Aunt Muriel about the cool book I just read. She cautioned me to give it some thought. I will never forget that. I thought The Fountainhead was the coolest thing since diet pills. I took Alyces advice and watched the Frontline piece and have embedded it here.....thanks Alyce! As those of you who know me are aware, I haven’t stopped asking “Is this fair?” From 2001 to 2008, some 40,000 U.S. manufacturing plants closed and 600,000 jobs disappeared while favored corporations had record profits and executive pay. The top 1 percent earners earn more than the bottom 120 million. The actual taxes paid by top earners is the lowest in my long lifetime. 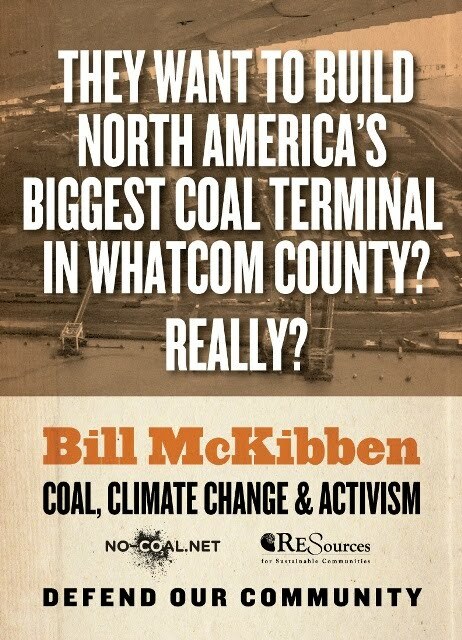 But it was last week’s KGMI program “Moneytalk” by Bob Brinker that sent me to Google. Bob has helped me for 26 years while I lived in Iowa, Albuquerque and now Lynden to learn to manage our money conservatively and wisely. Bob hears people who save and invest for the long haul, but clearly we and he are getting tired of the way the laws are rigged against us. We knew that the repeal of the Glass-Steagall Act in 1998 removed controls, but he told how the Commodity Futures Modernization Act of 2000 has been disastrous to the American people. The act had been worked on by lobbyists throughout 2000, but it was smashed through in the confusion of the contested Bush-Gore vote count. This act deregulated derivatives so that traders need little reserves to back their risk-taking. This is a form of gambling, and in fact the act included the stipulation that no state could contest these actions by using its own gambling laws. As Brinker called it, this is casino capitalism. Since then, a few people have made vast fortunes. The rest of us lost homes or equity in them, jobs, retirement funds and respect from other nations that suffered from the meltdown in the U.S.A. I am no banker or economist, but I know that as citizens we need to figure out how and why we are allowing things to go so wrong. If you also wonder, Google the Commodity Futures Modernization Act of 2000 and also the Frontline program, “The Warning,” an interview with Brooksley Born, who in 1998 foresaw the coming collapse. You will see many of the powerful people and forces that still control Washington, D.C., and Wall Street. After you check those things out (or if you are an economist or banker) and you want to call me, we’ll have coffee at Woods to talk about how we are affected and how we are going to pull back the veil from the power of lobbyists and their politicians as our country did early in the 20th century. We can’t keep giving our allegiance to the greedy few who cause so much confusion and pain to the good, practical people of our community. the letter here at The Lynden Tribune but you must be logged in to link to it. thanks Evan for this very well done enlightening piece! a friend sent this excellent post over at the Nation and I glanced down at the comments and thought this does not sound like who I pictured reading the Nation and even if a person had a reasoned disagreement it shouldn't come laden with hostility. Today in comment #6 I recognize a fellow human on the path to: how in the hell are we going to organize ourselves so our descendants will have a hospitable home on this beautiful planet? We must change our ways and do it now and I welcome the discussion about how we go about that. We are at peak everything and still no planet B in sight. Atmosphere, land, and water are the finite lifeblood we depend on. I hope we will jump in full speed, looking ahead seven generations. It’s not easy envisioning a more democratic and just economy not dominated by large corporations. It may be even harder to imagine ways to get from here to there, with giant corporations restructured or displaced altogether. The central involvement of the government in the private sector—as a direct market participant and as a rule setter—offers opportunities, too little appreciated, to spur new forms of economic organization. Consider the recent case of General Motors. In June 2009 GM—the world’s leading auto maker for much of the twentieth century, and the emblematic enterprise of the modern corporate era—declared bankruptcy. When it re-emerged a month later, the government was its majority holder. Remarkably, this move was accompanied by precious few ideas about how the government could manage and restructure GM to achieve social ends. There was no serious talk about directing R&D funds to speed the introduction of electric cars. No serious consideration of converting closed plants to produce light rail or other products for a sustainable future. No proposals to give workers—who own a sixth of the company’s postbankruptcy shares—meaningful control over the company, or to break it up. Instead, Obama administration officials emphasized their interest in returning GM to private shareholder control as soon as possible. The GM example is less of an outlier than it might seem. When the government took an ownership stake in Citigroup, AIG, Fannie Mae and Freddie Mac in the midst of the financial crisis, it also took a severely limited view of its role—imposing few obligations in exchange for the bailouts. Whether the public maintains control over an extended period or not, such ownership positions offer an opportunity to fundamentally restructure corporate giants. If the government is going to use taxpayer money to save corporations from disaster, it should seize the opportunity to reshape them for the public good. In our globalized world, old-fashioned geography is not supposed to count for much: mountain ranges, deep-water ports, railroad grades -- those seem so nineteenth century. The earth is flat, or so I remember somebody saying. But those nostalgic for an earlier day, take heart. The Obama administration is making its biggest decisions yet on our energy future and those decisions are intimately tied to this continent’s geography. Remember those old maps from your high-school textbooks that showed each state and province’s prime economic activities? A sheaf of wheat for farm country? A little steel mill for manufacturing? These days in North America what you want to look for are the pickaxes that mean mining, and the derricks that stand for oil. There’s a pickaxe in the Powder River Basin of Montana and Wyoming, one of the world’s richest deposits of coal. If we’re going to have any hope of slowing climate change, that coal -- and so all that future carbon dioxide -- needs to stay in the ground. In precisely the way we hope Brazil guards the Amazon rainforest, that massive sponge for carbon dioxide absorption, we need to stand sentinel over all that coal. 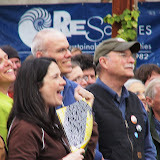 It was a great community gathering for Bill McKibbon's visit to Bellingham. 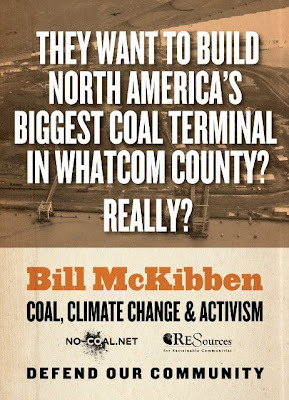 We are faced with a devastating future as corporate profiteers propose using our area as a conduit for our coal, barbarically extracted from public lands and shipped to China to be released into Earth's atmosphere heavily contributing to climate change and putting all life on Earth at risk. Coal as a source of energy production should go the way of whale oil. I hope we will be able to stop this irresponsible squandering of our descendant's future. while we are on the subject of coal I can't help thinking of the folks in Appalachia and today on Thom Hartmann's radio show Robert Kennedy Jr. was on talking about his new movie documenting the tragedy they are living with.